Thousands of people marched against the Trans Pacific Partnership Agreement (TPPA) nationwide over the weekend. There was palpable anger towards the government and their secret negotiating away of healthcare, and workers rights in favour of corporate interests. The secret trade negotiations stalled in Hawaii last weekend as the 12 countries bickered over what could and couldn’t be traded. New Zealand wants to go into bat for the dairy industry to undercut the dairy industry elsewhere, particularly the lucrative North American market; and US and Japan are squabbling over car tariffs. It’s patently clear to most people that this ‘partnership’ is one that benefits the rich and powerful of the 12 nations. In his usual contemptuous manner, Prime Minister John Key has blatantly admitted that under this agreement medicine prices may go up. We need to make the most of the stalled trade talks by putting more pressure on the government and building more resistance and opposition to these secret trade deals. We can’t just leave the opposition to the warring capitalist class. There’ll be one thing that they’ll be united about: screwing over ordinary working class people. The international nature of the agreement heavily favours big business – think along the lines of multinational corporations: big oil, pharmaceutical companies, and the tobacco industry. Not only will New Zealand workers be affected and exploited by this agreement, workers will suffer at an international level. When one considers a personally relevant effect upon the population, however, concerns become ones of healthcare and wellbeing. Ordinary people’s access to pharmaceuticals may be stymied by legal efforts of international companies, while tobacco and alcohol companies may even be allowed to sue governments if they attempt to curb rates of addiction. Labour’s recent foray into anti-Chinese bashing shows that they are willing and able to play the race card. They want to look like they’re standing up to National over the Auckland housing crisis. But instead of attacking National’s moves to sell state housing, the property investors speculating on the housing market or the slum lords who are raking in profits for substandard rentals, they’re blaming home buyers who have ‘Chinese-sounding names’. They’re quite happy to play Winston Peters’ tried and true race card. Sowing seeds of racism is poisonous for our side. It is the classic divide-and-rule tactic of the capitalist class that’s designed to make workers to see their fellow workers of a different ethnicity as the problem rather than potential allies in a common struggle. Sovereignty is not the issue; class is. 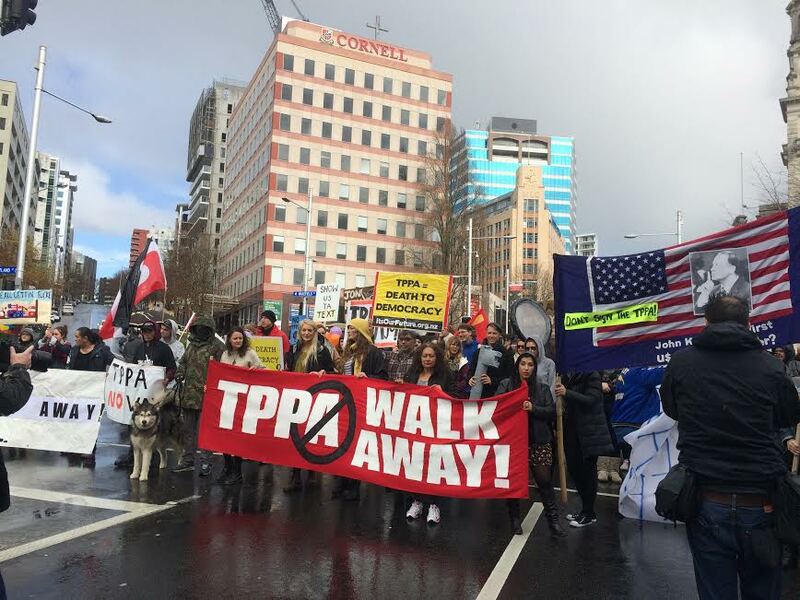 Plenty, if not a majority, of public objection to the TPPA is centred on concerns over the security of New Zealand’s sovereignty and independent authority in relation to legal proceedings. There were scores of speakers and placards nationwide that were protesting the threat to New Zealand’s sovereignty as the source of their contention. This has inevitably been escalated into a primarily nationalistic tone amongst protesters, which is harmless enough on the surface, but fails to reach the core of the problem and has the potential to breed harmful ideals beneath the surface. The problem with this rhetoric is that it misses the class dynamic in the TPPA. It’s not the US that’s forcing the TPPA down our throats: it’s the National government and dairy industry. They represent their own interests in these negotiations that are opposed to the needs and wants of the vast majority of New Zealanders. This may seem to be quibbling over semantics but its emphasis is important. Emphasising sovereignty also emphasises the idea that everyone in New Zealand has the same interests and are in the same boat against those overseas whereas emphasising class points to the bonds of working class solidarity and allying ourselves with workers in other countries affected by the TPPA. Workers in Japan, the US, or Canada will be equally screwed over. 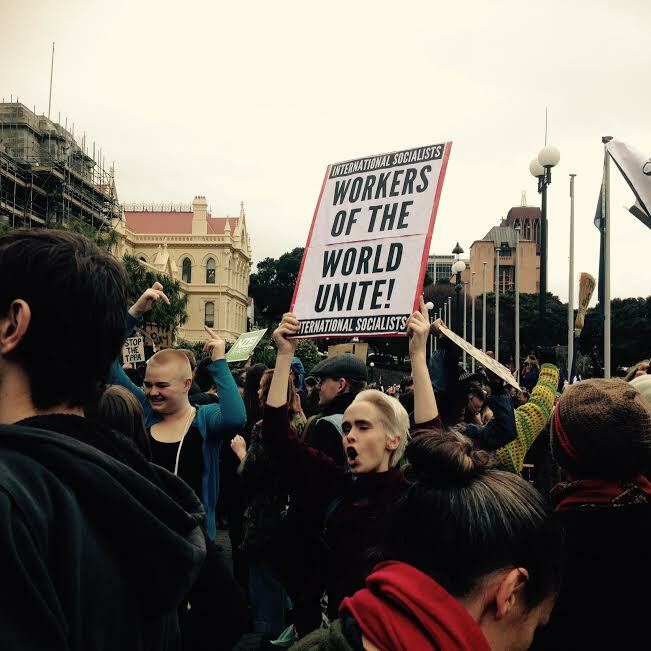 The realisation of the TPPA’s goals will increase this suffering and promote further exploitation of workers. The rallies this weekend link with previous rallies of thousands. There is an obvious dynamic of energy against this agreement – what we need now are political debates about the way forward for our side.